At 10:46 another puppy was born, and we are tired. However, we are still ready for more. We are proud to announce that at 10:35 P.M. another puppy was once again born into are nurturing arms and Shiloh's paws. Yet another puppy has come. We are so excited here as we try to guess the exact number. We all are fondly dawdling over these adorable gifts of life. At 6:34 another puppy was born. It too appears to be healthy, and the two pups are happily nursing as I type. We hope we will soon see many more. At 5:30 P.M. Shiloh gave birth to the first puppy. It is nursing happily, and appears to be very healthy. We anxiously await the arrival of its brothers and/or sisters. We will keep you posted as the events unfold. Is Labor Right Around the Corner? The week of Shiloh's due date is upon us, and it looks as though puppies may arrive toward the earlier end of our projected window. My husband and I had just returned from a homeschool convention late last night, and although Shiloh's temperature was higher when it was taken during the morning it had dropped significantly to 99.8 degrees by 10:00 at night. We had left our children and dogs here at home in the care of grandparents with all kinds of ridiculous instructions for both species. We are so grateful for our parents! Monitoring a dog's temperature is a very practical way to predict if labor will be expected within the next 24 hours. So, although Shiloh's temperature hadn't gone below 100 degrees, while my husband and I were traveling, we were just a phone call away in case we got the news that the big drop had occurred. 99 degrees is the magic number that alerts us a dog will be laboring within the next 24 hours. Well, this morning we anxiously took Shiloh's temperature, and it is in fact exactly 99 degrees. The very significant news is that in addition to the temperature drop, Shiloh also refused her morning meal. These two markers together is a concrete sign that pups are in the very near future. It seems as though Shiloh will be delivering these puppies earlier than her other litters, although well within the healthy acceptable range. We are all over-joyed and are making last minute preparations for the labor process. It can take many hours for labor to start, and we are planning on making the best use of this calm before the labor storm. We will have someone in the family post on this blog to let you know when the official labor begins (even if I'm busy whelping pups), and we will try to take lots of pictures to document this wonderful miracle! We are praying for a healthy happy delivery of precious puppies. We hope you all are enjoying a wonderful Easter Day with your family and friends. May the love of Christ fill your hearts and your minds with His goodness today and throughout the coming year. Our family just saw this animated video clip at church this morning and thought it was something worth sharing. May you treasure the hope of the cross. Happy Easter... Christ is risen indeed! We are so excited to announce that it looks as though the spring breeding has been a great success! We visited Animal Clinic Northview today for Shiloh's ultrasound. The ultrasound is a diagnostic tool used to confirm pregnancy and provide an estimate as to the number of puppies one can anticipate. We were delighted this afternoon when we learned that there are approximately 9 puppies growing peacefully in Shiloh's womb. Unfortunately, when a litter is on the larger side, ultrasound is not as accurate for determining an exact number as when the litter is small. We will perform an x-ray the week of April 16th that will give us a much more definitive number for the litter, so we will know more accurately how many puppies will be whelped. Currently, the puppies are each only about 1 centimeter long, and it is difficult to imagine just how much growing they will do within these next 4 weeks. We are really looking forward to this litter's arrival and are reminded how all of life is a precious miracle indeed! We are getting very close to breeding for our spring litter. Shiloh has been visiting the vet regularly to have her progesterone levels tested. We anticipate that the procedure will occur within the next 3 days. All of the progesterone testing that we have been doing enable us to perform the mating at just the right time which is the best way to ensure a successful breeding. There are many factors that contribute to an exemplary breeding, with timing being one of the most critical components. However, long before the actual breeding takes place is when the majority of decisions are made that will determine the outcome of each litter. The decison of which sire to father the litter is critical, and the process of finding just the right Sire takes a great deal of detective work. The goal is that the offspring of the two parent dogs will surpass each individual parent, and will lead to improvments in the Labrador breed. Every ethical breeder wants to better the breed that they adore and with each litter that comes into the world, they have the opportunity to do just that! Bettering the Labrador breed, requires excellent combinations with exceptional parent dogs that are healthy and have been genetically tested to weed out possible genetic conditions that may afflict the breed. Today, as I was reading the Sunday paper, I happened to come across an article by Lawrence Gerson, V.M.D. in the Pittsburgh Post Gazette, that mentioned this very topic. The article entitled, "Detecting Hip Dysplasia Early Can Be Critical for Dog Breeders" expounds upon the notion that breeders are charged with the responsibility of ensuring that the breeding stock they are mating are healthy and genetically sound. This is absolutely central to our breeding philosophy here at Kingridge Kennels. We understand that each puppy that we raise and train will go on to become a loved and cherished member of a special family. We would be heart-broken if one of those puppies was not able to lead a full happy life because of a genetic condition that could have been prevented. That is why we require tests for genetic conditions known in the Labrador breed. These include: x-rays for OFA hip and elbow certification, along with OFA screening for congenital cardiac disease, CERF eye exams, blood tests for Progressive Retinal Atrophy, and genetic testing through cheek swabs for Exercise Induced Collapse. We hope that by screening our breeding stock thoroughly, we will produce puppies that will remain healthy and happy throughout their life! We have been enjoying the month of January with a lot of relaxing and down time. After the holidays and with all of the chilly weather it is nice to mellow out and turn our focus inward. Shiloh and Lily have been having a wonderful time romping around together in the snow, in the rain, in the dirt, and of course in the mud. They are best buddies, and I wonder how Shiloh ever existed in our family without a jovial daughter by her side. Lily is growing larger and is maturing with grace. She is extremely smart and is very mature for a 4 month old puppy. We are all entertained by her mannerisms, and watching her and Shiloh play captivates the children's attention with as much awe as one of their favorite television shows. They are absolutely adorable together! With a new year comes new adventures and goals to pursue. I'm sure everyone plans on making some changes in the new year. Those "resolutions" may be trivial or deeply meaningful. It may be something specific that one would like to accomplish in the year ahead, or possibly a determination to give something up and make a sacrifice during the next 12 months. Either way, it usually involves trying to make a change in the new year to use our time for the better. We are working hard and playing equally as hard! Lily our recent Labrador addition has added tons of fun to our family, and we are all enjoying her presence and love. She is very trainable and as smart as a whip. Boy does that make training fun! We are looking forward to the time ahead and hope that this will be a year of great things for God's glory. As far as puppies go, we have one litter planned to be born in April. That will be the only litter born here at Kingridge Kennels in 2012. Just thinking about all of those future puppies and joy that is to come with the expectant litter makes me so excited. As more details unfold with regard to that breeding, I will let you know. In the meantime, I wish you a hopeful future and a year of new possibilities and promises in 2012! I hope you enjoy a wonderfully blessed Christmas celebrating all of God's richest blessings! We are so thankful for the gift of family, health, and the love of God. The best present of all is that God sent His Son as a little babe in the manger so many years ago to be offered as a sacrifice for us all. Today Christmas gives us such a warm peaceful feeling just like it did to those in the little town of Bethlehem thousands of years ago. It is the same feeling that can fill our hearts when we allow ourselves to reflect on the great love that God has for us as His children. It really is the most wonderful time of the year... It is hope! It is truth! It is pure love! Christmas is just around the corner, and as my children like to remind me, today is Christmas Eve Eve. We have had a busy few weeks with puppy training, and I have not had any opportunity to post about all of the many events. I'm sorry to all of you who had been anxiously checking in to find that nothing new was updated. I had planned on blogging about our schedule here so that you could get a sneak peak into a typical day of ours over these fast few weeks. However, I became so overwhelmed just looking at all of the events and hours spent training, cleaning, feeding, grooming, walking, and letting the pups outside in a 24 hour period, that I didn't sit down at my computer to write. Looking at the list alone made me feel pretty overwhelmed and pinched for time. It was absolute nonstop activity, but it was well worth every busy second! We are so proud of the pups in this very special litter. All of the precious puppies will be safely in their new homes by the end of the day today. They have each touched our life in such a lasting way. They have truly been a gift from God! I hope that in turn, they will be a gift to their new families this Christmas and for many many years into the future. We were blessed to have a list for this litter that was filled with wonderful families. I'm sure they will provide awesome homes for each puppy that they have recently welcomed into their lives and homes. I am going to miss them dearly! Although, I can rest in the peace of knowing that they are in the best possible homes and are deeply loved. We are excited to be keeping one puppy from the litter to add to our family. Formerly known as Lady Amethyst, we have decided to name our yellow girl"Lily". My children are so happy to be keeping a puppy. They all agree that she is the best Christmas present ever! That is good news, because I am woefully behind on my family's Christmas preparations. So, after the last pup leaves today I am going to go do some serious shopping. Thankfully (like a lot of women) that is an area in which I have a ton of experience :) There may not be as many gifts this year under the tree, but we will have our little Lily. I feel so satisfied though; knowing that we have already given one of the best presents of all... each darling puppy that will bring smiles to countless faces this Holiday season. What a thrilling gift! Over the past few days we bathed each of the puppies for the first time. Now, not only are they smelling super sweet, but they have had a wonderful first exposure to the water. The pups were rather hesitant in the tub and did not react like they will in a few short months. Because this was their first time in water, they were completely enthralled with the experience. The photos below capture each one with sopping wet fur but as adorable as can be! Oh what fun we have been having! The puppies are going to be 8 weeks old soon, and we have been very busy. When the pups turned 7 weeks old we took them to the vet for their first set of shots. After they had been immunized, we then allow them to go outdoors. It was a big day here when the puppies were able to explore outside! They loved every minute of it, and now are going out several times a day to work on potty training, and walking on lead. We also recently started whistle recalls and the early conepts of retrieving. Each of the pups have his or her own gifts. Some are very responsive to one activity and seem to have little interest in another. With tons of positive motivation and praise (not to mention some delicious treats) each is improving day by day. They are eager to learn, and we are eager to teach! It is a beautiful combination! We have gradually increased the time that each puppy stays in their crate to 1 hour at night. Over the next two weeks that will increase incrementally until they are sleeping for a 4 hour stretch over night. We have begun leash training and are thankful for the cooperative weather. Here in Pittsburgh the temperature has been unseasonably mild for the month of December. The other day we went for a quick puppy walk in t-shirts and flip-flops! I am betting that luxury will not last, and snow will soon be on the way. It's hard to believe that Christmas is just around the corner and each of our sweet puppies will be enjoying the holiday season with a new family in only 2 weeks. Now that we have finished Obedience Personality Testing, and have determined the best puppy match for each new family, I will be posting more videos and pictures in the days to come... It is truly the most wonderful time of the year! I hope you are all busy preparing your hearts, homes, and minds for this Christmas season and the imminent arrival of your precious new puppy! The pups are 6 and a half weeks old, and are having so much fun! We have been socializing them every day with many new experiences and opportunities. I hope you all had a wonderful Thanksgiving enjoying all of God's bountiful blessings. He is the provider of all good things. We had a full house for Thanksgiving and enjoyed dinner with a lot of our extended families. Our celebration of Thanksgiving lasted the entire weekend. I love when you have big families, because holidays tend to spill over and last for several days rather than just one. We feel very blessed indeed! This year the hit of our Thanksgiving festivities were unquestionably the puppies. My cousin (also named Joy) is an amazing photographer, and she was able to capture some adorable pictures of the pups at Thanksgiving. Reflecting on on their precious faces, I am reminded just how thankful we are, as a family, to be able to raise, train, and nurture these little puppies. They bless us is so many ways every day. I hope that all of the new families who will be welcoming the pups into their homes in the next few weeks will enjoy them just as much as we do. After having the pleasure of meeting many of the families on this list, I am confident that they will indeed! Thanksgiving next year in each of those families will be a special time when they are able to count each of their Labs as one of the many blessings they hold. I am continually amazed at how God loves to give us relationships and things that put a smile on our face and a song in out heart. He truly does delight in giving his children good gifts! Blocky headed puppies looking to the right. This chocolate Labrador puppy has big green eyes. Kingridge Puppies are as cute as can be! Our Labradors are held to very high standards! Frogs and snails and puppy dog tails... that's what little boys are made of! These little guys are also made with a hefty dose of pure puppy sweetness. So here are the 5 week pictures of the handsome guys from this litter. After much reading, and trial & error, I think I figured out the basics of our new camera. The pups are so unbelievably cute! I hope these pictures capture some of the preciousness that these little boys display everyday. The puppies turned 5 weeks old yesterday! In only 1 week they have changed and grown so much. We began socializing them about a week ago, and they have been really enjoying learning all about the great big world! We follow the 7 Steps to Socialization which ensures that each and every pup gets a broad exposure to all that life has to offer. So far, the puppies have felt the new sensation of carpet on the pads of their paws, listened to the vacuum cleaner, played with various toys, eaten out of a few different types of food bowls and dined in several locations. We have a checklist that includes each pup's name along with the goals we have for various social experiences. All in all, the puppies will systematically be exposed to 49 different socialization experiences before their eighth week of life! It is almost unimaginable that 4 weeks have passed since the current litter was born. They are amazing in every way! The meal depicted in the photos below started out in the same fashion all of the others do, but in the middle of eating I grabbed my camera to capture a few adorable moments. This gives a good idea of what mealtimes look like here, at Kingridge Kennels, although we usually don't have puppies who fall asleep in the middle of lunchtime. They usually wait until after they have taken care of their business, and are clean, to conk out. Either way, eating is most always followed closely by sleeping. Their bodies work hard to digest that food and use it to grow! The puppies are sleeping for about 85% - 90% of the day at this point. Over the next few weeks that percentage will decrease as the puppies play and explore more, with a bit less need of sleep. However, they will still need a great deal of sleep, and just like a newborn baby, they will continue to require frequent naps throughout the day. Since the pups have turned 4 weeks old, we are now ready for visitors. If you are currently on the Kingridge puppy list for this litter, please feel free to contact me so that you can schedule a time to come and enjoy them. We will schedule you for your own time - preferably over the weekend - so that you can interact with the puppies and become familiar with the litter. These pups fell asleep in the midst of eating, and I thought it was adorable. Some of their brothers and sisters are still at the same bowl munching on puppy food. While some of the puppies are still busy eating others finish up faster. As I begin washing down some of the awake pups, these guys are waiting to be cleaned. Usually the pups need to go potty after they eat, then they are cleaned by either their mama or me, the bedding is changed, and finally they take their nap. Here is a little puppy being washed down with a warm rag after his hearty meal. This little pup has just been cleaned and now sports a cute little hairdo. This is the freshly cleaned, sleeping group of puppies. Every day each of their features change as they grow and develop. Most are sleeping soundly after their meal. Lady Q is looks contemplatively at the camera, wondering what all of the fuss is about. Here you can see the different shapes of the puppies heads. At this point it's too early to tell specifically what they will look like in the future. As their bones grow and develop, changes in their structure happen almost overnight. Here are the freshly washed pups huddled together in the midst of sleep. Finally everyone joins the puppy pile for a long sweet sleep with full little tummies. The pups just started eating solid foods, and the video below shows them eating for the very first time. Needless to say, they loved it! Each of them knew exactly what to do and had a blast exploring this new phenomenon of dog food. They sniffed it, ate it, and stepped all through it :) I'm not sure what was messier when they were done eating... the bowl, the whelping box, or the puppies themselves. Shiloh will be nursing them less and less as the days pass, and with that transition comes the new concept of pottying in a designated area. We have officially started the very early stages of potty training. This means we have to keep an eye on the pups and change dirty bedding every half hour during the day. We don't do this because we are neurotic (although that could be debated :) , rather the key of future success with early potty training is keeping the pen immaculate! That is quite the feat when there are 10 little mess makers romping about. We are busy, but all of the diligence will pay off with puppies who are able to grasp the concept of pottying in a designated area earlier than they naturally would. I'll keep you posted! The puppies are enjoying their first meal and growing stronger and cuter with each passing day. We introduce the pups to solids after they have turned 3 weeks old. They love it! We all enjoyed a wonderful day here full of festivities and fun. The kids went Trick or Treating, and although it was cold and rainy we had a fantastic time. The children were so excited to dress in their costumes and collect candy. I was amazed at how many adorable dog costumes there were to choose from at the stores! We had a hard time deciding what Shiloh would be this year. We finally decided on a swimsuit. After her recent litter of puppies, Shiloh still had the figure for an "incy wincy teeny weeny orange polka dot bikini that she wore for the first time today"... Sorry, but I just couldn't resist the lyrics to that classic song. All of the puppies are well over 3 pounds and are nursing like it's going out of style. Shiloh's consumption of food and water has been so great, because the pups are such vigorous nursers... it definitely shows in their growth. Speaking of eating, I hope everyone had a Happy Halloween and treated themselves to some scrumptious candy. I know I had more than enough of my kids' candy, but hey- that's one of the advantages of having five generous little trick or treaters! Over the past few days all of the puppies have opened their eyes. Although some of them are still little more than slits, we can tell the colors. The yellow females have blue eyes, along with the lighter chocolate male. The black ones all have dark eyes, although in pictures the flash makes them appear blue. Since their eyes have opened the pups are becoming more inquisitive about their environment and surroundings. They have also started taking an interest in humans. When I sit in the box they come over and investigate by sniffing and snuggling. Everything is still blurry but they are able to see light and movement. Over the next days and coming weeks their vision will continue to sharpen and they will show even more interest in objects. In tests of learning, stimulated pups were found to be more active and were more exploratory than their non- stimulated littermates over which they were dominant in competitive situations. Secondary effects were also noted regarding test performance. In simple problem solving tests using detours in a maze, the non-stimulated pups became extremely aroused, whined a great deal, and made many errors. Their stimulated littermates were less disturbed or upset by test conditions and when comparisons were made, the stimulated littermates were more calm in the test environment, made fewer errors and gave only an occasional distress sound when stressed." At Kingridge Kennels we feel strongly that the first few weeks of each puppy's life are critical! It is during this small (often overlooked) window that pups are able to develop many physical and psychological traits that will remain with each dog for his or her entire life. We are so satisfied knowing that we are doing all we possibly can to provide each puppy with the best start possible. Soon the period of intense socialization will begin, but for the next few days we will continue to do our part implementing the therapy in the BioSensor Approach, so that we can help to create super pups with a strong foundation for success! I was checking on the puppies a few minutes ago and noticed that Sir Jasper had his eyes open! Earlier this afternoon I checked and all eyes were still closed. Needless to say, the kids and I had a little mini-celebration. The photos do not do his sweet little eyes justice. They are dark and gorgeous! I'm sure that the others will be following his unfolding very soon. It's like an early Christmas over here! Shiloh is busy bathing the puppies before a feeding. They are all growing well and just starting to walk on all fours. You can even here a cute little bark starting to form! Each of the puppy's eyes are still sealed shut, but we are expecting them to open during the next few days. It is so thrilling to see their eyes for the first time! It is like a present that is going to be delivered and opened at just the right time. Because there is a chance that the lighter chocolate and one of the yellows will have green eyes, it only adds to the suspense. Every time I clean the whelping pen (which happens several times a day) or perform BioSensor therapy, I check to see if I can see a tiny glimmer of an eye opening... Nothing yet! Well, I am overjoyed at the beauty of this litter, and the life that has been created within each of these pups. They are so precious, and growing stronger with each passing day. The risk of losing a puppy to illness also diminishes as the puppies grow larger and gain more immunity from their mama through her milk. They are also much more able to withstand variations in the temperature of their environment from this point on, because now they can shiver if needed. All of those variables help me to relax more and more with each passing day, and instead focus on enjoying the happy frolicking of sweet little puppies. That is so much better than worrying. Shiloh has been feeding the puppies with so much patience. It is like a frenzy at an all you can eat buffet! We have helped each pup grow consistently and fairly by rotating feedings. This helps the smaller puppies to put on weight, while preventing the larger ones from guzzling down more milk than they need. We are sure to document their weight during morning and evening BioSensor therapy so that we can monitor their progress. Nice even weight gain is favorable, and so far that is what we are seeing in each of the puppies. There is nothing better than watching the development of puppies who are healthy, hungry and happy! What a blessing to be able to witness such a miracle... the miracle of budding blossoming life. We have been very busy these past few days. All of the puppies are growing nicely, and Shiloh has been doing an excellent job taking care of all of all of their needs. She has been very careful and seems to have adjusted to tending to 10 puppies with great ease. She is so attentive that I can't even weigh one of the pups without her jumping out of her whelping box to closely monitor my activities. Shiloh has also watched us perform BioSensor Therapy with a quizzical expression and great concern. It is a joy to observe each of the puppies during the moments of therapy and see their individual characteristics. Even at this very young age, they have slight nuances in their temperaments. It will be quite interesting to see if these early traits last, or if they develop and change as the weeks go by.... only time will tell. The video below shows the puppies' development in these past days and also includes a few pictures of BioSensor Therapy which is administered to each puppy twice a day. Our puppies are 3 days old and we have started BioSensor Therapy. Twice a day we stimulate their neurological systems to provide results during these early days that will last a lifetime! The puppies are here! We just got back from the veterinarian's office with 10 healthy puppies. Shiloh had been in mild labor since yesterday, and this morning during contractions we noticed some signs that labor was not progressing as it should. We ended up performing a c-section at the vet's office this afternoon around 1:30 pm. The good news is that they are all healthy and nursing like champs. It seems that the cause of the labor inertia was that two puppies were both trying to make their way through the uterus and out at the same time... I guess it's an early case of sibling rivalry to be in first place :) Thankfully, all is well! I am sure everyone would like to know the colors and genders of the litter, so I thought I'd include some statistics about the litter. *The two yellow puppies are female. *The three chocolates are all male. *There are five blacks, of which one is female and the other four are males. weighs a good amount for such a large litter. We'll be sure to take lots of pictures along the way to capture the sweetness of this wonderful bundle of pups! Here are our little ones anxiously awaiting the arrival of Shiloh's little ones! Shiloh is huge and we are sure she is showing some signs of the early stages of labor. She has been panting throughout the night and all day today. She also has been "nesting" by investigating different locations inside and outside of our home to use as her nest- none of which are nearly as nice as her lovely whelping box! We will see to it that ultimately she labors in the home, but it is very common for dogs to go off and find a private secluded area in which to birth the litter. The biggest development is that Shiloh has been refusing food!!! That is a big deal, and it is a very accurate sign that labor should be getting underway within the next 24 to 48 hours. We are trying to get extra rest and tidy up the home so that we can devote our undivided attention to the whelping and first days of life for each of the puppies. Their most vulnerable time is right after birth. The pups are small and helpless with little ability to regulate their own body temperature. We will be encountering many sleepless nights ahead... so now is the time to get some rest and prepare for the big event. I think I am nesting just as much as Shiloh! We have been taking Shiloh's temperature twice a day for the last few days, and although she is showing some signs of impending labor her temperature has not yet dropped as a concrete indicator. I will write more as labor draws closer, but for now I'm going to go tidy up my nest- and then get some rest just like mama Shiloh! With fall in full swing we are anxiously awaiting the autumn litter's arrival! We visited the doctor this afternoon for an X-ray to determine a more precise number of pups that we can anticipate. It looks as though the X-ray confirms there are indeed 10 puppies. They are all approximately the same size, and as far as the veterinarian could tell they all looked healthy. For now, Shiloh is growing rounder and rounder day by day- or it seems hour by hour. She looks as though she is ready for these puppies to come at any moment, but pups are almost always born very close to their expected due date. When progesterone testing has been performed to determine the date of ovulation, one can be relatively certain (within a few days) when labor will begin. We are preparing our home for the wonderful arrival, by getting all of our whelping supplies in order, and assembling the beautiful whelping box that my amazing husband custom built for our litters of sweet little puppies. I do believe it is the finest whelping box in existance... Plus it is beautiful! It only seems fitting to have a special environment for such a lovely process like birth. There is nothing that compares to witnessing the miracle of new life coming into the world. We are so eager to meet all of these precious puppies! This day will forever be etched in America, and throughout the world, as one of intense grief and profound loss. It is also a day to reflect on the great acts of heroism that occurred on September 11th, 2001. Men and women of great courage gave their very lives to protect countless others. As man's best friend, dogs were also involved in the rescue efforts. Many of the canine rescue dogs were faithful Labradors. In the 10 years since 9/11 we are so blessed that our beautiful nation has been protected from any further terrorist attacks. The memory of the devastation from 10 years ago is almost too much for words... My prayers are with each of those who have lost loved ones on this day. May we never forget! It was a fabulous day indeed! We enjoyed our ride to Animal Clinic Northview just outside of Cleveland and were thrilled with the news presented to us at the ultrasound. Dr. Hutchison began counting puppies and after counting upward as fast as he could said, "There are puppies everywhere..." and there were. Just as twins sometimes hide on a human ultrasound, the uterus was lined with pups that were hiding behind each other and peeking in and out of view. Dr. "Hutch" said we were expecting a larger than average size litter, but the exact number of puppies is still just a projection. When a litter is small the ultrasound can more accurately portray the precise number of puppies, but with a larger litter the screen becomes more... littered :), which makes it a bit more difficult to determine the exact number! He guessed somewhere around ten, but only time will tell for sure. You can see some of the amniotic sacs that are apparent on the ultrasound picture above. functioning umbilical cord (which can also be seen in the picture to the right, toward the bottom of the darkened area called the amniotic sac). Can you imagine what a narrow thread the umbilical cord would be on such a tiny Labrador puppy? It is a miracle indeed! To aid in the optimum development of each puppy in the litter, Shiloh will be increasing her food consumption and continuing on her prenatal vitamins. Although outwardly she shows no signs of the budding life that she carries within, she will need more rest, food, and vitamins as the pups quickly grow. It will only be a matter of a few weeks before Shiloh's belly begins to bulge. At about this time we will perform an X-ray to determine the exact number of puppies expected for delivery. However, the color and gender will remain a surprise until the moment of birth. I feel as though many prayers have been answered, and I am so happy that it looks as though many of the wonderful families who are on the waiting list will have a healthy beautiful puppy as of Christmas this year. Cheers! Happy Labor Day! It is a wonderful weekend to relax and enjoy the end of summer. I hope delicious foods, fun with family & friends, and lots of relaxation from your labor are in store for you this weekend. We are doing all of the above along with celebrating our son's 4th birthday. It's hard for us to imagine that he was born 4 whole years ago! I think it's rather fitting that we can celebrate his birth on Labor Day weekend... "Labor" get it? I remember VERY well all of the hard labor that was involved with his birth. Although labor is at times most assuredly painful; any mother would agree that the fleeting pain is well worth the rewards of a precious new baby. Soon, our Labrador Shiloh will be experiencing the same sensations of birth as she labors to give life to her new litter of puppies. Celebrating birth is always such a joy! Anything truly beautiful usually has great work involved in its creation. Precious children, neatly weeded flower beds, and sweet well-adjusted puppies are some of the best blessings this world has to offer, yet each needs great care, a lot of hard work, along with love in order to thrive. We are planning a weekend with time to reflect and remember that labor & work produce things that are truly wonderful. The gift of work is a privilige that we each can use to make our corner of the world a lovely, more fruitful place. Even if it means getting your hands dirty, great personal sacrifice, or moments of intense pain, the results of many investments are worth the work involved. So congratulations on all of your daily toiling and may you take deep satisfaction when reflecting on a job well done! They are known as man's best friend. They are loved by millions of Americans. They help the blind to see, and the handicapped to regain the ability to function. They will fill your heart with fondness and bring a joyful smile to your face. They will never be upset with you or harbor anger against you for a past offense. They love unconditionally! They are faithful until the end... This link to a very touching video shows the devotion that this soldier's chocolate Labrador "Hawkeye" (pictured to the left) had for his master. It was a love that lasted until the grave! I can't help but reflect on someone else who loves us each with the same devoted, selfless, loyal love... Only His love is perfectly pure and it never ends... "For I am convinced that neither death, nor life, nor angels, nor principalities, nor things present, nor things to come, nor powers, nor height, nor depth, nor any other created thing, will be able to separate us from the love of God, which is in Christ Jesus our Lord." Death doesn't symbolize the end, but rather, I believe it just the beginning of the journey. It is a wonderful pleasure to share in the great adventure with a devoted loving Labrador by your side. I think God gave us the love of a faithful dog to allow us a glimpse into His heart. It must be a heart similar to the Lab's- full of adoration and true unconditional love... But it's deepness knows no end!!! These past few days have been important ones for us! Over the weekend we visited Dr. Hutchison at Animal Clinic Northview and he performed a transcervical AI. After one more AI our part of the breeding will be complete. The rest will be left up to nature! Shiloh's due date based on the breeding is October 13th. If she delivers on the projected date that would mean the puppies will be 10 weeks old and ready for their new homes on Thursday, December 22nd. That will be quite a Christmas gift! I do already have our ultrasound scheduled, so I can provide an official date to announce the number of puppies expected in the litter. We are scheduled to return to Ohio to see Dr. Hutchison on September 6th at precisely 2:15 in the afternoon. I will bring my phone with me at that point so I can post the results, here, on the blog. We are very excited and are praying there will be beautiful, healthy pups growing in Shiloh over the next few months. I will let you know if there are any further developments, and please let me know if you have any questions or comments. You can email me or you can even post right on the blog. "For a simple variation on more standard massages, try your usual process with a pair of white socks on your hands. The sensation is quite different for the dog because you are covering much more surface area with each stroke, and because your hands look funny with socks on them." Langbehn, Jenny. 97 Ways to Make a Dog Smile. Workman Publishing: New York, 2003. As I've mentioned before the Labrador Retriever has a propensity toward becoming overweight. Because of most Labs love affair with food they tend to struggle with weight issues. It is the responsibility of a loving owner to make sure that their Labrador is not spoiled with treats and does not become over-indulged. Let me tell you - that is difficult! They can easily begin to "wrap you around their finger" or should I say "paw" with those sweet brown eyes and kind endearing expression. There are many articles that alert Lab owners to this dangerous but common struggle. The paragraph below was taken from 24petwatch.com and explains the dilemma. "A major health issue that is worsening for Labrador Retrievers is obesity. Labs naturally have very hearty appetites and most have perfected the art of begging for treats! A Labrador’s diet should be closely monitored and they should be taught from a young age that begging for table scraps is unacceptable. Owners must also ensure that their Labrador Retrievers receive adequate exercise which helps fight obesity, a major cause of many devastating health problems. A healthy Lab should have a slight hourglass figure. Any excessive weight puts them at risk of arthritis, diabetes and hip dysplasia." So although this is a serious issue for the Labrador breed, we can bring some levity to the situation and have some fun with today's dog smile challenge. It can be applied to our canine friends who are large or small, young or old, thin or not so thin... but loved without measure. Enjoy! "For our portly friends, place one hand (palms flat) on either side of the dog's body and gently shake the flesh." canine can actually lead a longer healthier life. I encourage you to read the article in US News entitled The Pet Prescription. It describes just some of the many health benefits that our dogs (especially in my opinion - our Labradors) have given to us. So, not only do we have the privilege of enjoying life side by side with a loyal comrade, but we also reap lasting benefits, both mentally and physically, from their endearing faithful companionship. It is a great miracle that a furry creature who is so dependent on us can bestow such a gift; while they are at the same time, such an amazing gift in themselves. So, love your dog and thank them for their "gift" as you spend time enjoying them today. Today one way I encourage you to thank them is by applying Jenny Langbehn's fourth suggestion in her list of ways to make a dog smile. I just know your dog will thank you for trying out this fun exercise. And just maybe you can thank your dog too :) ! "Using both hands, gently knead (don't pinch!) the excess of your dog's back and scruff. Sing a rousing rendition on "That's Amore" as you knead the dog's skin like pizza dough." Oh the summer is such a wonderful time of year! We have been home from our vacation for a few weeks now, and I am finally starting to get back into the swing of things. You've got to love the hot lazy days of summer :) The kids have been having a blast playing outside in the heat, and Shiloh surely is as happy as a lark, jumping through the refreshing sprinkler. I thought I would take these warm relaxing days to post some excerpts from a cute little book that we enjoy by Jenny Langbehn, entitled "97 Ways To Make a Dog Smile". The book introduces all kinds of clever ways to make your dog smile... and while your dog probably won't display a full toothed grin, I guarantee they will be smiling in their heart, if you try to apply these principals over the next few weeks. If you own a Labrador you know that they are notoriously happy go lucky dogs anyway. They are motivated by a heart of gold that loves to please! These exercises will lead to even more devotion and love... They are a fantastic way to bond with your best friend, regardless of their breed. I will post a selected challenge every few days. I challenge you to prepare yourself and those in your family to take time to play with your dog, and be sure to try to include some of these specific simple exercises in your life. 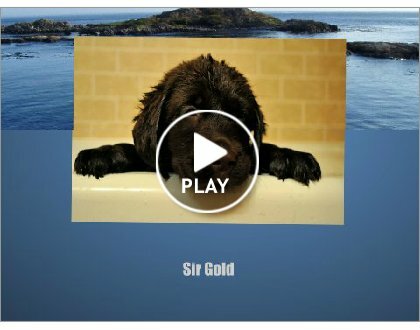 I would love to hear from you if you are playing along with us, as we make it a point to take the time to shower our Lab with specific acts of love and attention. When you perform each exercise, be silly with your dog! Be sure to have loads of fun, and then relax and enjoy these sweltering long days with a happy, sweet, content canine lying lazily by your side. "A tried-and-true massage location, the ears are very sensitive sites. At the base of the ear, gently rub your knuckles in true noogie fashion. (To make a noogie, form a half fist with your knuckles sticking out.)" It was bittersweet the day we presented Mister B to his new owners. "Pignon" is the name that his new family gave to him and it is a French word- pronounced "Pinough". From now on I will use his real name because that is now who he will always be. We have been using his name from the 4th week on, so that he could gain familiarity with its use. We are so happy that he is went to a wonderful home in which he will be lavished with love and affection, but we had grown so exceptionally close to him throughout his months shared with us. We feel blessed to have had the opportunity to raise and nurture such a phenomenal dog. Pignon was, and always will be, something very special to us here at Kingridge Kennels. It may be that the situation of a singleton litter will not repeat itself for quite sometime - if ever! Through this rare experience we were able to gleam so much about the nature of Labs. We will always remember Pignon with love. I am will be posting a slide show that documents the life of Mister B / Pignon... I hope that the summer provides each of us with a relaxing break and a time to reflect on life. We are looking forward with anticipation to our fall litter and will post more as events progress. Learning to Walk on a Leash... Like a Dog! Labs love the water! You've heard me say that before.... So when Mister B turned 7 weeks old we gave him his very first bath. With Shiloh keeping a watchful eye, we sudsed the puppy and allowed him to experience the thrill of the water. He enjoyed his bath but was not too fond of the loud sound caused by the running water. We got him all cleaned up- and fluffed up- to participate in his personality obedience testing that was administered at 7 weeks. Mister B has been exploring his expanding environment and conquered the steps with a little help from his mom, Shiloh! This was our fist singleton litter and WOW the one puppy that was born is such an amazing little guy! He is so inquisitive and social... even for a Lab. He explores everything around him with eager anticipation. This was the first week we have allowed him to really explore outside. He loves it! He has exuberantly been chasing butterflies, birds and leaves. Really anything that moves if fair game! Life is an adventure for this little guy. Being solo has not hampered his style at all, because of his insatiable curiosity. He doesn't sit back and wait for life to come to him, rather he goes and finds the excitement. However, what makes Mister B really shine is that when he is not out exploring, he is so calm and snuggly. He is extremely affectionate and attentive to people because he has no other litter mates. Therefore, typical of most singleton puppies, he is very people oriented. He truly is an amazing pup! His new owners are in for a treat... because he is very special indeed. He has been sleeping in his crate with his mama, and has been pottying outside. He is also already starting to sit on command- for food of course :) He is highly intelligent and an all around phenomenal dog. A singleton litter is rare indeed, but with it comes a special privilege- a pup that is just as rare and special. The weather has finally been changing here in Pittsburgh and we are so thankful. It seems that we have had a very long cold winter, and spring has- until a few weeks ago- been slow to, well... spring! Recently however we have been experiencing undeniably gorgeous Pittsburgh weather with perfect daily temperatures. Our whole brood has been itching to get outside and take advantage of the blue skies and sunshine so that is what we have been striving to do. It gets busy with puppies, school, and housework but days like these don't come around too often here in Pittsburgh. We have to enjoy each one that God sends our way! The only possible downfall that I can even imagine with spring is the wet earth and mud that are left from the heavy spring rains. We are told that the flowers bloom boldly in May because of those April showers, but for Labrador lovers heavy spring rain produces an entirely different result.... Water = Mud! become favorite attractions, to children and Labradors alike, during the wet Pittsburgh spring. Yesterday, Shiloh was clean, bathed, freshly-scented, and even adorned in a fancy new pink bandanna when the mud beckoned her to come take a quick dip in its warm endless waters. Needless to say, both she and the bandanna needed to be bathed, but that was pure pleasure for her as well because... Bath = Water! And so the cycle continues. A Labrador loves the water! They were created for it...literally. Their feet are genetically designed with the purpose of swimming through its depths. To always insist that your Lab stay out of the water, mud, bathtub, puddles, (you name it) is to deflate a core part of who they are and what they were created to do. So, as the rains come and the grass turns a vibrant shade of green, I will look at the blue sky and laugh to myself as I notice the brown paw prints drying on the living room floor. I know all to well, that mud washes away quickly; but the memories of a jovial Labrador and her laughing children will echo in the recesses of my mind forever. We hope you have a blessed Easter. Enjoy celebrating this most special day with your family and friends. I love this video that depicts the love that has been poured out for each of us. It is profound and beautiful to contemplate who we are in God's eyes. We are praising the Lord for all of His miracles and blessings in our life... like sweet little puppies! 4 days - 1 lb. 13 oz. The Whelping of "Mister B"
It is always a miracle when new life is brought forth into the world. Yesterday, the single puppy in our April litter was born. I will relay more of the story once the sleep deprivation ceases a bit. The whelping was difficult, but "Mr. B" as we will temporarily call him is large, healthy, and beautiful in every way. Ahhh...the miracle of life!